Identifying observational and experimental approaches that predict the strength of species interactions in natural communities. In many cases, if we are to predict complex ecosystem responses to impacts such as species extinction or introduction, changes in disturbance regime and altered levels of limiting resources, models incorporating multiple mechanistic pathways, such as those typical of webs of interacting species, will need to be applied to data from real ecosystems. Complex models can predict virtually any pattern of change in ecosystem variables, depending on the parameter values used, so in order to be usefully applied, their behavior needs to be constrained by empirically-derived parameters. Functions describing the strength of interactions among species are one key suite of variables in such ecological models, because they play a key role in transmitting environmental impacts through a system. 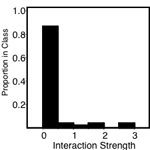 I have been exploring different strategies to estimate interaction strength empirically. In several papers (e.g., Wootton 1994a, Laska and Wootton 1998, Wootton and Emmerson 2005), I have identified some of the theoretical challenges of estimating interaction strength in natural ecosystems, and suggested some directions in which we might profitably proceed. 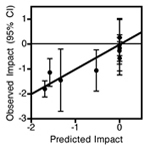 Field experiments provide an unambiguous way to identify impacts arising from particular species, but their widespread application is logistically prohibitive, and estimating interaction strength from their results is much less straightforward than one would expect because indirect effects and feedback loops can arise and are hard to account for. Hence I have been examining other possible approaches. Direct observations of rates at which species interact is sometimes feasible, and I have worked out methods to convert data such as feeding rates and population sizes of consumers and resources into theoretically-appropriate interaction strength estimates. I carried out such a study using intertidal bird feeding observations to estimate the range of interaction strengths between birds and their prey, and then made quantitative predictions about system responses to experimental manipulations of birds (Wootton 1997). In general the predictions matched the average response of experimental tests well, indicating that such observations could be useful in parameterizing interaction strength. There are limitations to using the approach, however, as not all species interactions are as easy to observe directly. In the future, I plan to explore an alternative approach using energetics relationships, which has become very popular but has never been evaluated experimentally. I am currently focusing my attention on another approach, which uses patterns of community dynamics to estimate interaction strength parameters (Laska and Wootton 1998). Most ecological models relate the dynamics of species (rates of change over time) to prior ecological conditions, yet empirical ecologists rarely investigate community dynamics. Part of the difficulty is that few long term multi-species datasets exist that can provide the dynamical data necessary for this approach. 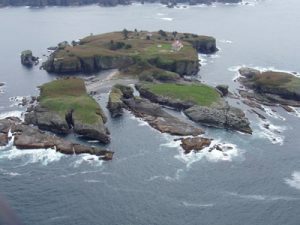 In order to address this problem, I have been developing a long-term dataset of multi-species abundances for replicated plots in the intertidal zone of Tatoosh Island, Washington. Data collection began in 1994 and the temporal span of the data set continues to grow annually. In addition, our simulation studies suggest that the approach works best if the system is perturbed well away from equilibrium, so I have also implemented several long-term experiments, as well as initially assigning plots to sites with different recovery times after wave disturbances, to probe a wider range of parameter space. I am also exploring alternative approaches such as qualitative loop analysis, and energetics and allometry (e.g., EcoPath).